For the second time in a little under a month, I managed to follow a recipe *almost* to a tee. Hey, I’m getting good at this, and I have to admit that I’m really starting to enjoy it, too! It’s allowing me to get a real, genuine taste of other people’s creations’ true flavor profile and expand my own, by the same token! This time, it was a recipe out of Joshua Weissman’s latest cookbook, The Slim Palate Paleo Cookbook that I decided to try out “as prescribed”. 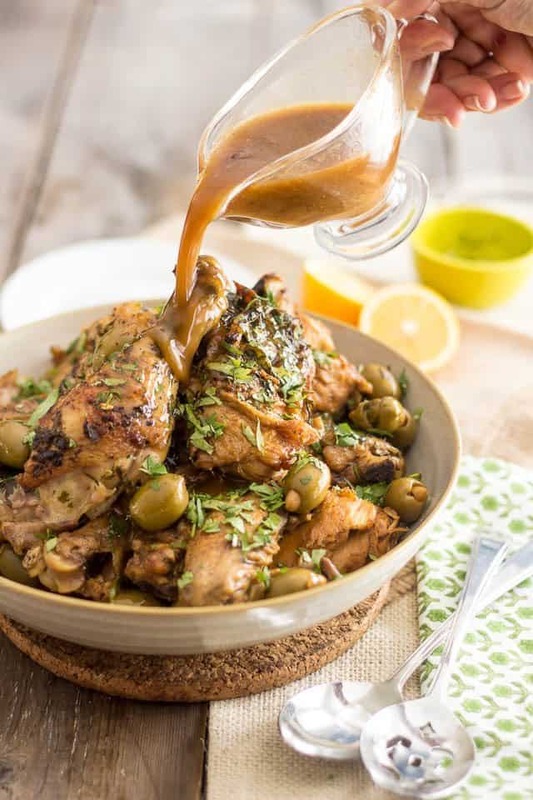 All I did to modify this Braised Moroccan Chicken recipe is, one – I doubled it and two – I changed the cooking method. I chose to braise my chicken in the oven as opposed to doing it on the stove top, like Josh’s original recipe instructed. Oh, and I used Meyer lemons instead of regular and Almond Stuffed Green Olives instead of Pimiento Stuffed, because that’s all I had on hand. Other than that, I stayed entirely true to the original recipe. And I must admit that I was MIGHTY impressed! I will DEFINITELY be making this one again and absolutely can’t wait to try more of Josh’s recipe. Wait. You do know Josh, right? Joshua Weissman, the amazing blogger behind Slim Palate and author of The Slim Palate Paleo Cookbook? If you don’t, I strongly urge you to visit his blog AND to get his cookbook, too! Seriously, Josh has got to be one of the most impressive kid out there, EVER! Yes, you read that right. I said KID! For Josh would in fact still be in his teenage years. That simple reality will honestly never cease to amaze me. Seriously, the fact that this recipe book was written by a teenager absolutely BLOWS MY MIND, and I really think that it will blow yours, too. The level of maturity that Josh exhibits is absolutely astounding: the recipes that he elaborated are surprisingly complex and sophisticated, well refined and always CRAZY mouth watering! Each and every single one of them!And, I really mean that: Josh’s picture taking skills are BEYOND excellent. They make my photos look pale in comparison! The book is worth getting if only to lose yourself in the beauty of the printed images that illustrate each and every recipe. And if that alone wasn’t enough, Josh also has an amazing story to share, in that he managed to lose over a 100 pounds simply by turning from trendy diets to real food. 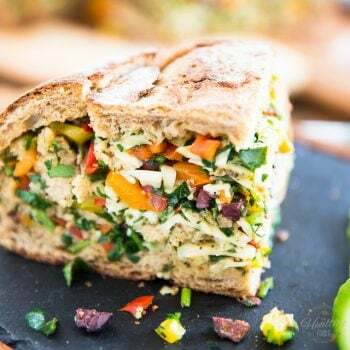 In his book, not only does he share a whole bunch of his favorite recipes, but he also shares how he developed a sensible, yet still indulgent, philosophy of eating for health and happiness. Can you say inspirational? I think this kid has a brilliant, and HEALTHY future ahead of him. Trust me, you NEED to get your hands on his book. It might very well transform your life, too! Josh has even generously offered to send a FREE copy of his cookbook to one of my readers! Oh, and not just any copy, either… A SIGNED copy! You lucky people, you! GAH! I wish I could enter that giveaway myself! Take advantage of this generous offer and enter for your chance to win by using the form at the end of this post. For now, let’s get busy cooking! Start by cutting the chicken into pieces. I prepped my chicken as follows: bone-in breasts cut in half crosswise, legs, thighs, and wings, so that was 10 pieces per chicken, total. Sorry, I didn’t include a tutorial on how to cut the chicken. I wouldn’t want to be responsible for missing fingers and emergency trips to the hospital! Me prepping chicken is something you do NOT want to see. I think I’m a tad dangerous and would make any butcher out there grimace, for sure! 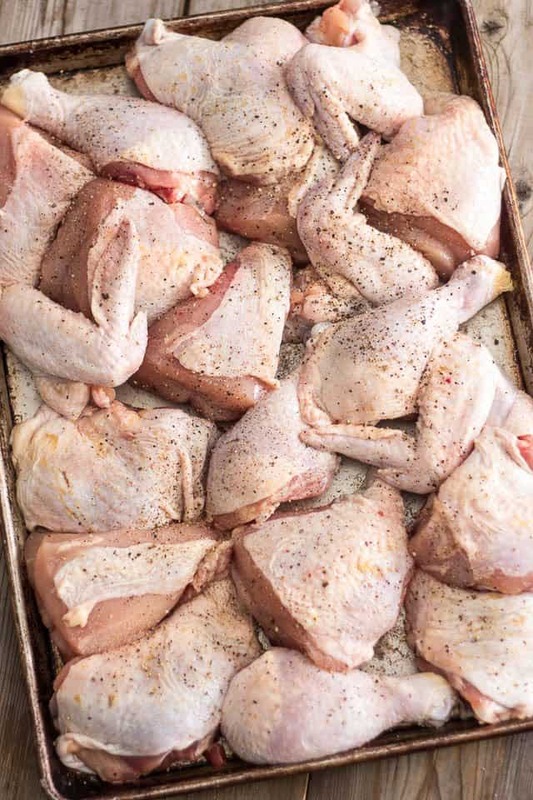 Once you’ve got your chicken all cut up, pat the pieces dry and sprinkle them with salt and pepper. Prep the rest of your ingredients so you have everything ready to go when needed. Set a large Dutch oven over high heat and melt the ghee. Add the pieces of chicken, a few at a time, being mindful not to overcrowd the Dutch oven, and cook until crisp and golden, about 4-5 minutes per side. 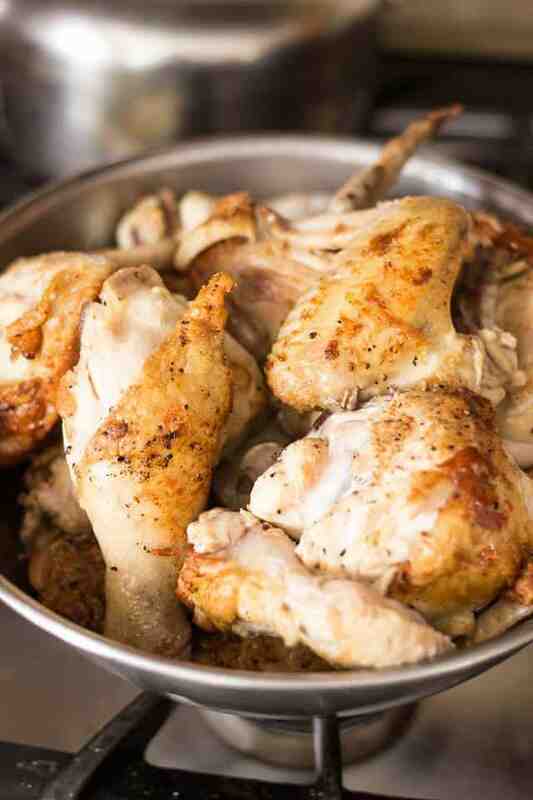 Remove the cooked pieces of chicken to a large bowl to collect the precious juices. Once all the pieces are browned, reduce heat to medium and add onion and garlic. Cook for 2-3 minutes or until onion starts to soften and turn translucent. 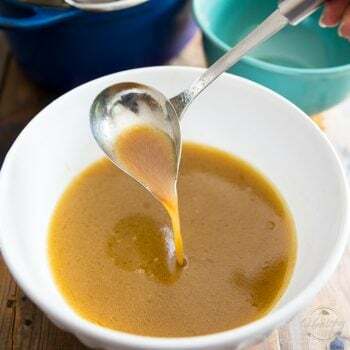 Add spice mix and continue cooking for about a minute, stirring constantly to avoid burning. …and make sure you scrape the bottom of the pan to detach every little bit of flavor. Bring the liquid to a simmer and then add the pieces of chicken back in. Don’t forget the meat juices. Add olives, sprinkle with half the cilantro and half the parsley, then squeeze the juice of 1 of the lemons. Although Josh, in his original recipe has you braise this in batches on the stove top, I chose to take the lazy route and dumped everything in the Dutch oven and braise this at 350F oven for 1 hour, until the chicken got really tender and fell off the bone. Already looks amazing, doesn’t it? You could almost serve this as is, right out of the Dutch oven. 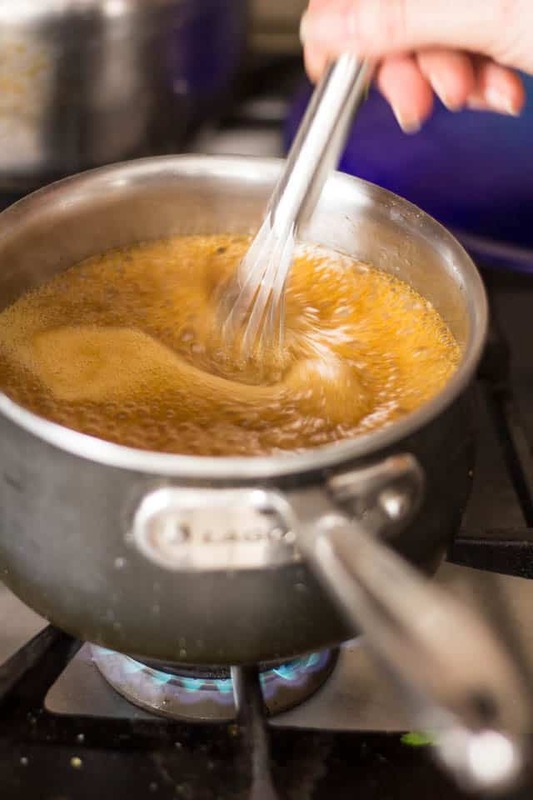 But we’re gonna take things one step further and turn that braising liquid into a luscious and tasty gravy. 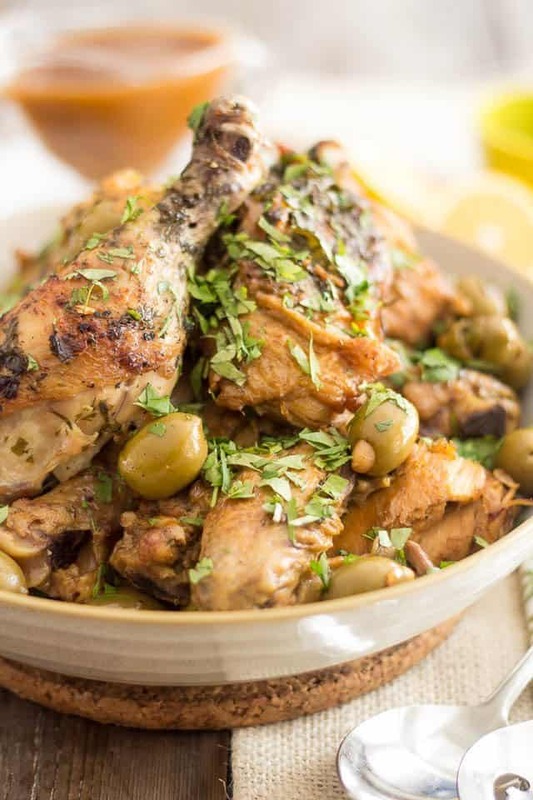 Remove the chicken and olives to a large shallow bowl or plate and strain the cooking liquid through a fine mesh sieve directly into a medium saucepan. Squeeze in the juice of the remaining lemon. Bring back to the boil and cook for about one minute, whisking constantly. 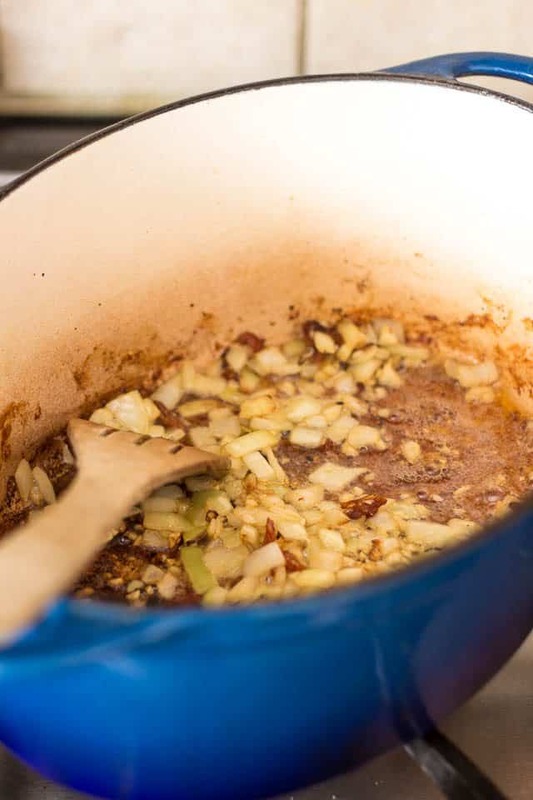 … and serve with the thickened braising liquid poured right over top. 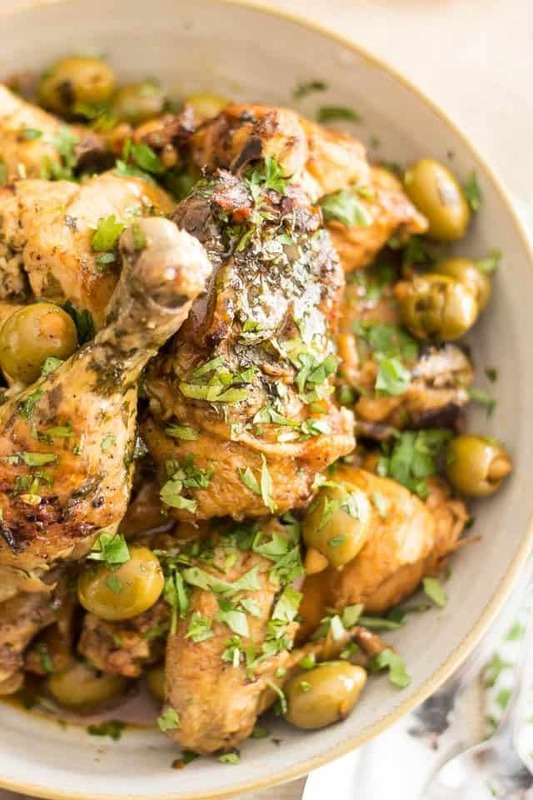 This chicken dish is so tasty and moist and juicy, I bet this will instantly become a favorite in your household. I know it has in mine… Wait. Is a household of one still a household? Bah… what does it matter, really. A favorite is still a favorite, no matter the size of the household! 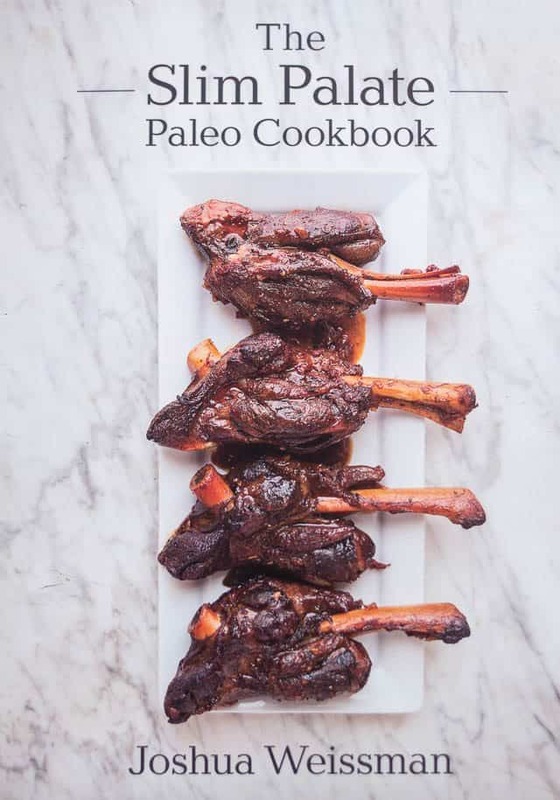 And now, take a second to enter this giveaway for your chance to win a signed copy of The Slim Palate Paleo Cookbook. In a small bowl, mix together all the spice ingredients. Set aside. Cut the chicken into pieces (bone-in breasts cut in half crosswise, legs, thighs, and wings), pat dry and sprinkle with salt and pepper. 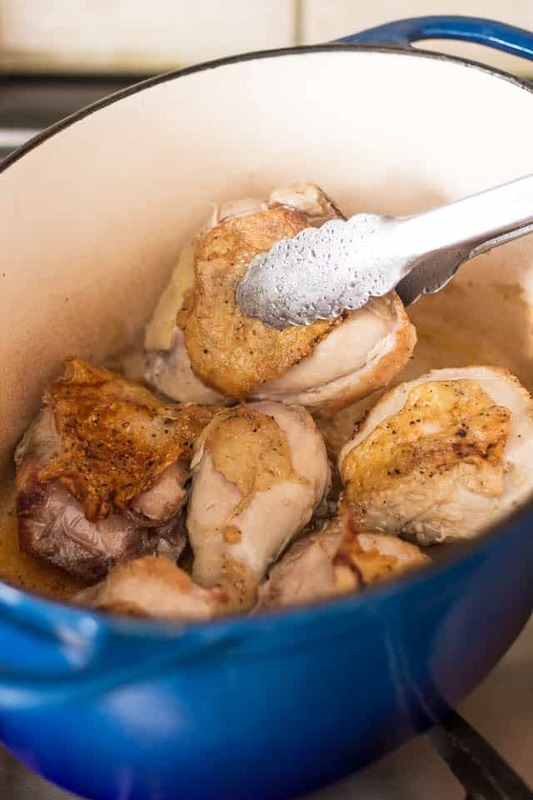 Remove the cooked pieces of chicken to a large bowl to collect the juices. Once all the pieces are browned, reduce heat to medium and add onion and garlic. Cook for 2-3 minutes or until onion starts to soften and turn translucent. 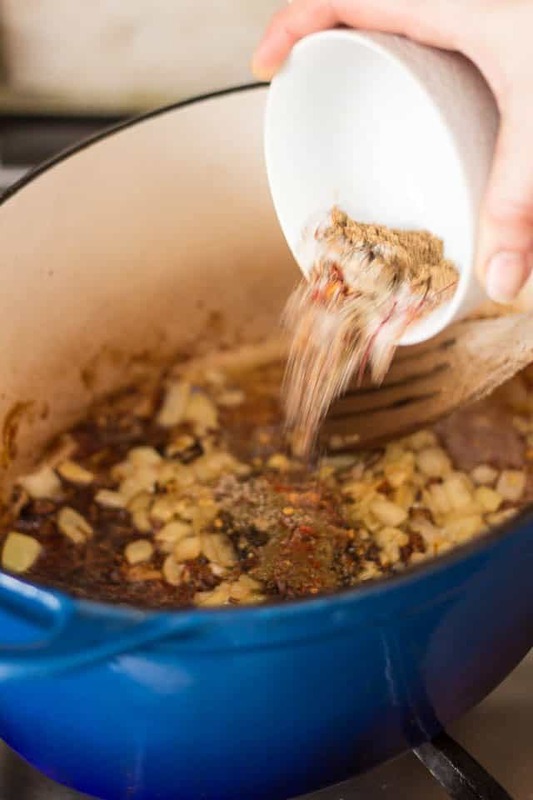 Add spice mix and continue cooking for about a minute, stirring constantly to avoid burning. Add the water and scrape the bottom of the pan to detach every little bit of flavor. Bring to a simmer then add the pieces of chicken back in. Don't forget the meat juices! Add olives, sprinkle with half the cilantro and half the parsley, then squeeze the juice of 1 of the lemons. Put the lid on and place in a 350F for 1 hour. 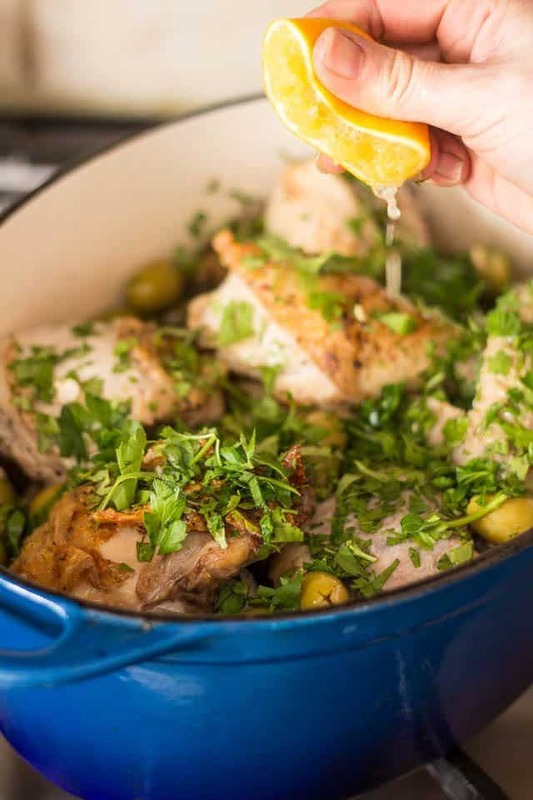 Remove the chicken and olives to a large shallow bowl or plate and place in the [still warm but no longer on] oven to keep warm. 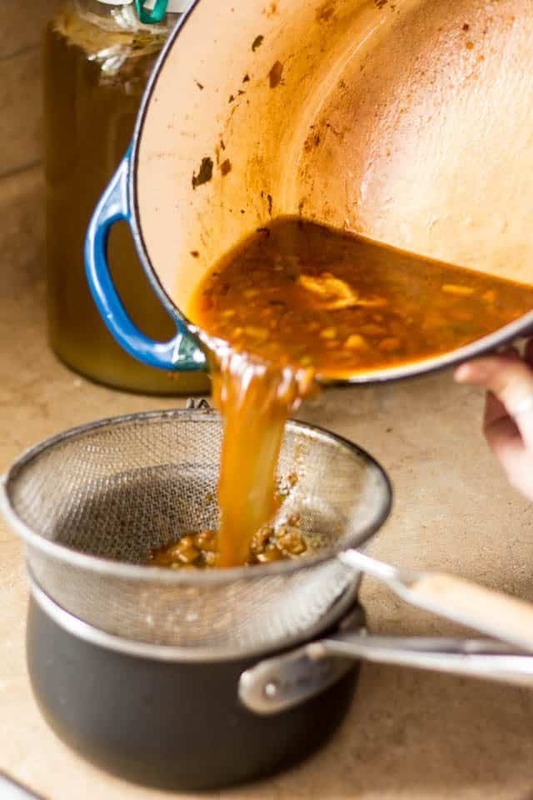 Strain the cooking liquid through a fine mesh sieve directly into a medium saucepan. Squeeze in the juice of the remaining lemon. 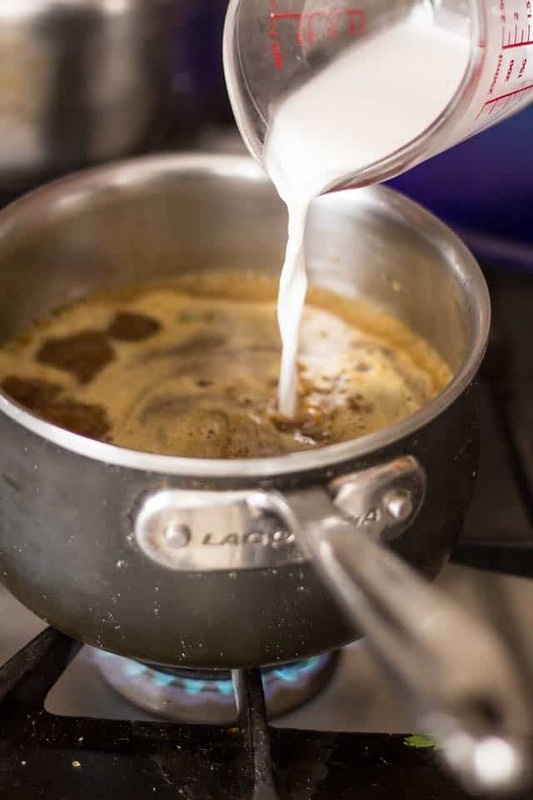 Dilute the tapioca starch in 2 tbsp of water and pour that into the simmering cooking liquid. Bring back to the boil and cook for about one minute, whisking constantly. 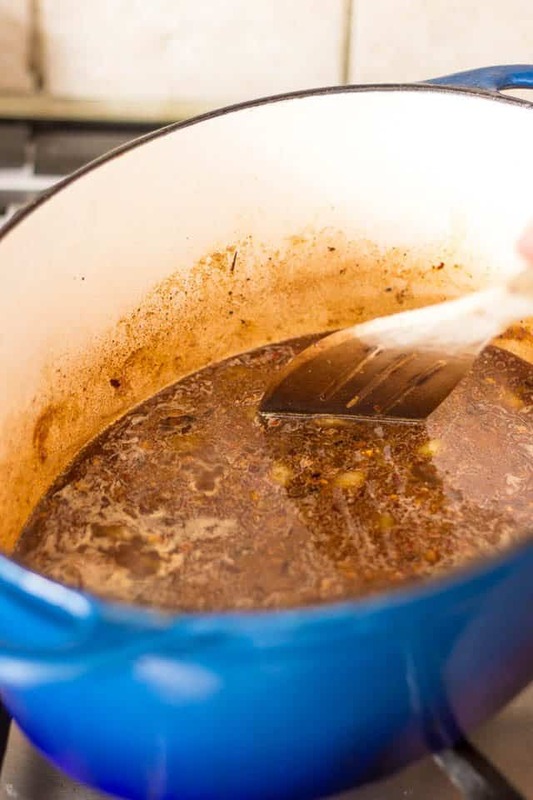 Serve the chicken with the thickened braising liquid poured over top. Josh is incredibly awesome in that he is not only talented and creative, but he reaches a demographic that hasn’t really been represented in the ancestral/paleo community. Hats off to you, Josh! This looks like a great book to have on the shelf! I would love to have a copy of this amazing young man’s cookbook. Joshua’s pictures blow me away. Some of the best out there. Looks awesome Sonia and good for you for being able to follow the recipe verbatim (almost) to the letter. What an inspirational guy 🙂 With great recipes, too. 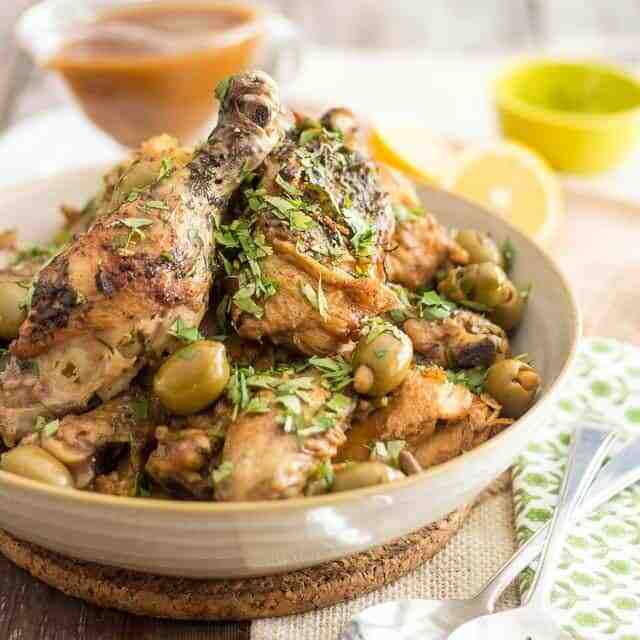 I don’t what’s happening t me, but when I get to see chicken recipes, I suddenly feel like drooling like hell (LOL). Kidding aside, I really want to try this one out to make a good impression to my cousins who will be coming over to our house. Perfect since spring has just started, and what’s good to serve is something healthy to compensate the almost taxing hibernation during winter (talking bout visitors who act like bears; LOL). Thanks for sharing this. Can’t wait to try out. Cheers! This looks delicious. 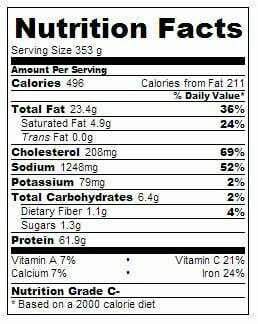 It’s high in sodium, so I would have to see where I could cut it down. Looking forward to trying this out with a few tweaks. Since the olives prior to using–this helps. Or, buy canned green whole olives–at better markets–canned in water. Meant RINCE the olives. I do this with capers too. 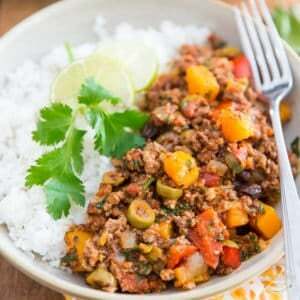 Tried this recipe tonight and it was sooooo delicious! I would love the cookbook and hope that these recipes could help my husband successfully lose weight. Im not an olive fan but this still looks amazing!! Wow! Josh sounds absolutely amazing! I just hopped over to his site and he is everything you described and more! 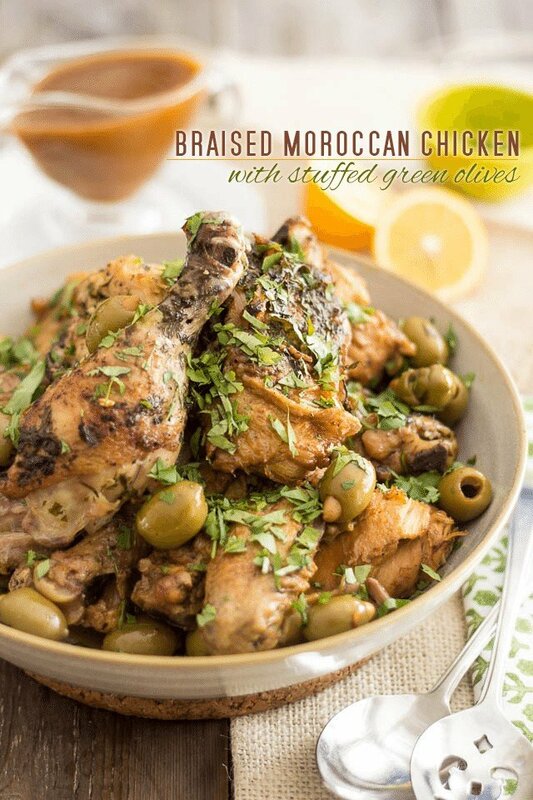 I’ll be making this moroccan chicken AND buying his cookbook! Thank you so much for sharing! I found Josh’s website a while ago and was going through all the beautiful posts and then read his bio. WHAT. 18?! This kid is four years younger than me and has a successful blog, cookbook, etc.. self esteem depleted haha. But in all seriousness, he has really got something special. I wish him the best of luck. This looks like another winner. Can’t wait to try it! Looks wonderful can’t wait to try it. The chicken looks great! Can’t wait to try it! OMGosh that chicken looks incredible! I must make it. I would love a copy of The Slim Palate. Thanks so much for the opportunity to win it. i’ve been wanting this cookbook. Love to win a signed copy of cook book as my fiancé says will do all the cooking haha!! 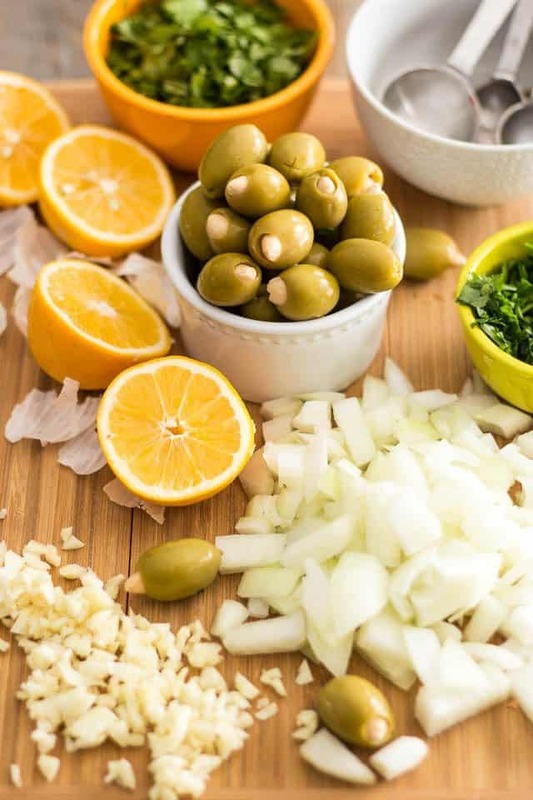 I saw your post on Facebook and just had to click on it…..this looks so delectable….I can’t wait to try it out on my family….I love the idea of green olives stuffed with almonds. This looks so yum! So does that cooky book! 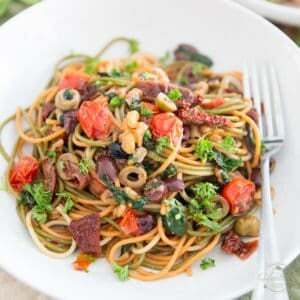 Love anything with olives, so can’t wait to make this!!! Love to win the cookbook! The recipe looks delicious! 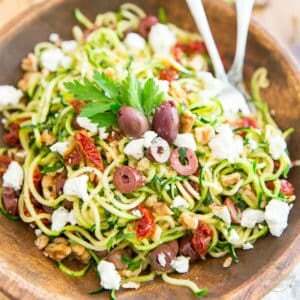 Can’t wait to try this recipe and I love that it has the nutrition information included! Looks delicious!! Can’t wait to try this..wonder if black olives would work? The dish looks tasty…would love to win a copy of this book. 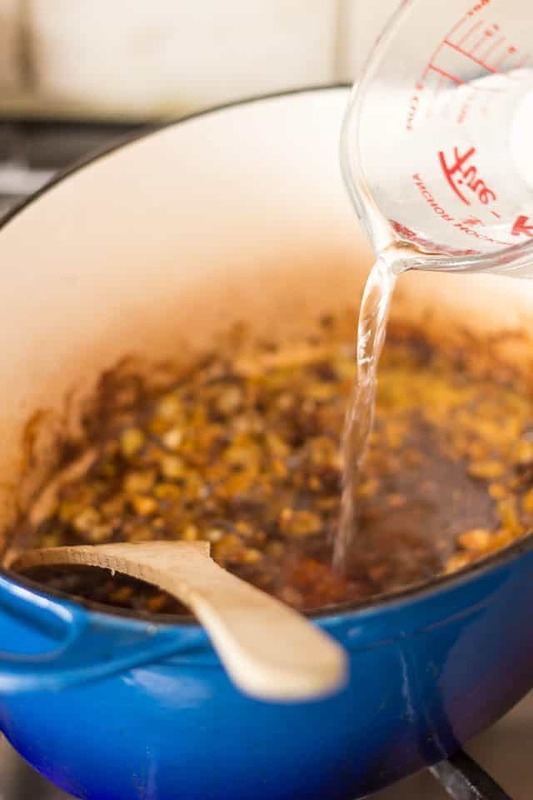 i love braised foods, and this recipe looks amazing. all of josh’s recipes that i’ve tried so far have tasted as amazing as they look, so i’m sure this one will be no different. thanks for a great giveaway! 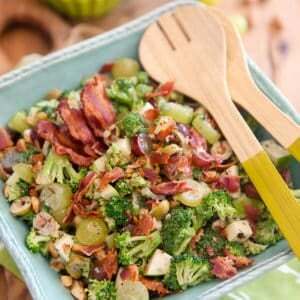 That recipe looks delicious…except for the olives! I’d absolutely leave them out. I’d love to win the book! My roommate and I cook together a lot. He loves green olives so I think I will put this on the menu soon! Thanks for sharing and the opportunity to win a book. It is amazing and wonderful when young people take hold of their health. Looks delicious! Would love to win his book and try this recipe and every other one! I am very excited to read the cookbook! the recipes are totally doable and healthy to boot. I’ve been wanting to buy this cookbook. I love chicken meals. 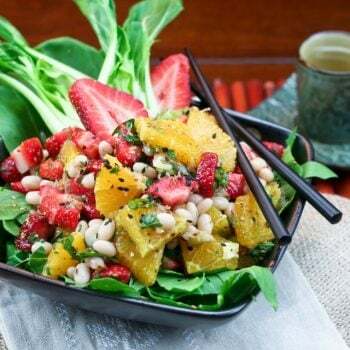 This looks really good, have to try it this week! What a beautiful recipe! I would love to win the cookbook and try more of Josh’s recipes! 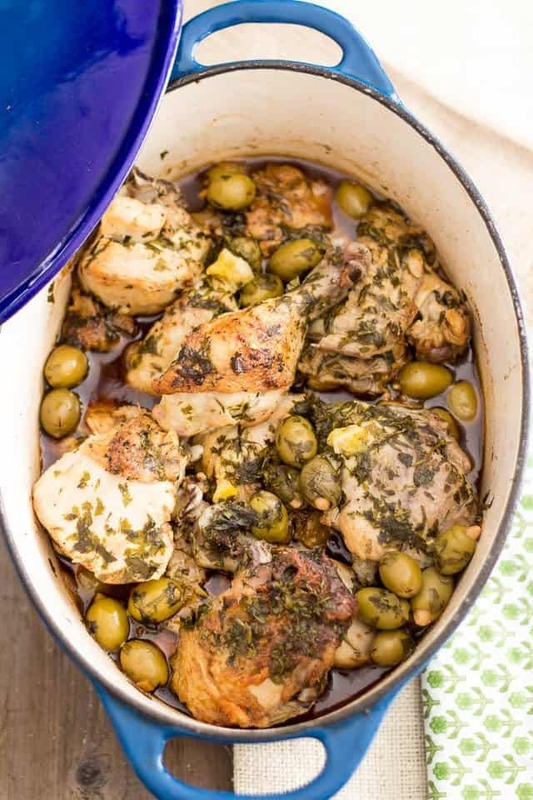 It’s like a stove-top tagine–that looks incredible. Love your blog. I’m trying slowly to change my eating habits. Being a type 1 diabetic paleo makes much more sense! I’d love to win the book giveaway and try out even more new recipes! this looks so great! i’m gonna try it tomorrow with boneless skinless thighs, since that’s what i have in my fridge…i think the flavors will still be outstanding! 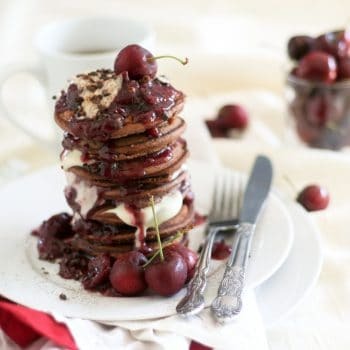 This recipe looks SOOOO good and your pictures look beautiful as always! I found Josh’s blog when I first went Paleo and was also astounded by his age and his inspirational story. I would be so excited to win his signed cookbook. I’m sure it’s the first of many! Looks delicious, cannot wait to taste this ! I just started paleo a few weeks ago and have been pleased with how I feel already! Cannot wait to try this recipe!! This is happening tonight ! Please wish me luck for cutting my whole chicken in pieces. Wow – what a beautiful recipe and an even more enticing recipe book! This looks so divine! You’re pictures are so good, everytime I try taking pictures of my cooking it always ends up looking like dog food. Even if it tastes great. I can’t wait to win this cookbook! Great recipe. Looking forward to more! Had 4 boneless/skinless chicken thighs + 2c of cooked rice so: used 100% of the spice mix (fresh ginger instead of dried) + 3c of H2O (not 5c), only 45 minutes in the oven (30 would have done) & didn’t bother to strain the broth, then added 3 jarred pequillo peppers coarsely chopped (my olives were unstuffed) + mince of 1/2.peel of preserved lemon (more authentically Moroccan flavor) + rice. Delicious. I decided to try this for a little Sunday Funday party with 10 or so people. Oh. My. Goodness. This was so delicious and full of flavor. Every last piece of chicken was gone. I even saved the juice and made the exact same thing for dinner the next night for just the roomies and myself. This was awesome and so easy!! Delicious! I was also too lazy to strain the sauce and prefer it with the chunks in it, and it was great! Used black olives as that’s what I had. Also did chicken quarters instead of whole chicken and used a tagine so a lot less chicken fit and lots of sauce left over, but I poured it all over some brown rice pasta – yum! Did it all stovetop. My son loved it too. Thanks! Thank you so much for the great feedback, Angie! I’m real happy to hear that the dish was to your liking. And black olives you say? Bet they were fantastic! Now I have to try that!